Profiles > Jim Colucci - eGuiders. We Search. You Watch. Jim Colucci is a freelance entertainment writer whose work has appeared in such publications as TV Guide, Inside TV, Quick & Simple, InTouch, Rosie, The Advocate, Next and CBS' Watch magazine, where he serves as a Deputy Editor. Since 2008, he has covered television and other entertainment media in his popular blog, Must Hear TV. Jim also delivers a weekly on-air version of “Must Hear TV” as a correspondent for “The Frank DeCaro Show” on Sirius satellite radio . In the fall of 2004, Time Inc. released Jim’s official, authorized companion book to one of NBC’s biggest comedy hits, entitled Will & Grace: Fabulously Uncensored. His second TV book, The Q Guide to The Golden Girls, was released by Alyson Books in September, 2006. In television, Jim co-created an original animated pilot for the Disney Channel, and contributed comic material to four annual Oscar-themed comedy specials airing on Comedy Central, hosted by his partner, Frank DeCaro of The Daily Show With Jon Stewart. Jim has written for entertainment media since his days as the Film Editor for The Daily Pennsylvanian, the college newspaper at the University of Pennsylvania, where he graduated with a degree in marketing from the Wharton School of Business. Originally fromWayne, New Jersey, he now lives in New York City with Frank and their mischievous Boston terrier, Herman. 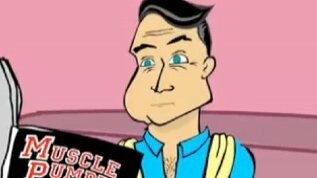 Frank DeCaro, the flamboyant movie critic from The Daily Show with Jon Stewart, stars in this animated pilot about a trio of...er... "never-married" men, and their adventures in keeping LA safe from the pettiest of petty crimes. In the interest of full disclosure, I co-created this series, along with Bonnie Datt. And Eric Stilan -- known to Frank's fans from his hit radio show on Sirius XM as "Eric in San Francisco," has created the colorful world in and around Mr. Keith's Beverly Hills salon. Keep watching for future episodes, guest starring fun celebrity voices!